Mobile financial services in the developing world could be worth $5bn by 2012, say analysts. CGAP - a consortium that works to expand financial services in developing countries - said the growth in mobile coverage was helping to fuel growth. More than one billion people in the developing world have access to a mobile phone, but no bank account. In February 2009, Bill Gates pledged $12.5m (£8.6m) to help the world's poor access banking services. The Consultative Group to Assist the Poor (CGAP) said it thought the number of people with access to a mobile phone, but no bank account, would to rise to 1.7 billion in 2012. It also expected more than one in five to use their mobile to access banking services, creating a market worth up to $5bn (£3.05bn). "There's a lot of excitement, but very little understanding what's going on," said Mark Pickens, microfinance analyst at CGAP. He said that mobile operators were ideally placed to launch mobile banking services in the developing world as banks were unlikely to put in the huge investment required to set up branches across a country. "Customers have already purchased point of sale - it's in their pocket," he said. 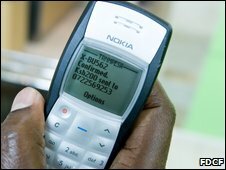 One of Africa's first mobile banking system, M-Pesa, launched in Kenya in March 2007. A network of more than 7,000 agents - mostly shopkeepers - was set up to take deposits and issue cash, with users authorising payments on their mobile phone using a Pin code. That service has now expanded to include Tanzania and Afghanistan with plans to launch in India, Egypt and South Africa. Safaricom, East Africa's biggest mobile operator, said it expected M-Pesa to generate a profit this year. Other firms, such as South Africa's MTN and Kuwait's Zain are piloting services similar to M-Pesa. A similar service has also launched in the northern Somali region of Somaliland.